International CES -- the biggest tech show of the year -- kicks off in Las Vegas this week. While we're expecting a ton of innovative products from big name companies, some of the smaller gadget and gizmo offerings unveiled at an event Sunday night tease a bit of what's to come. From a high-tech fertility tracker to a 3D photobooth, here are some of the quirky technologies debuting at the conference. The First Order Stormtrooper robot by Ubtech is designed to be a "companion robot," but it's more of a cutting-edge toy. 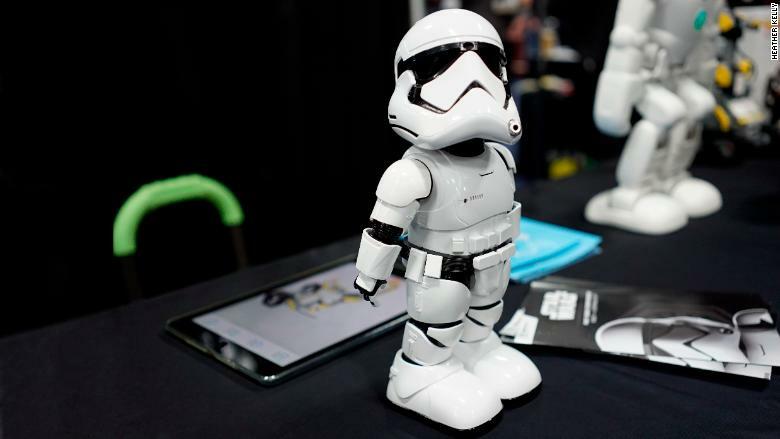 The Stormtrooper can recognize up to three different people's faces and understand voice commands. An infrared sensor, accelerometer and gyroscope help it navigate unknown environments. It also has an app that lets you see the world through its eyes and go on augmented reality missions. The $300 robot is for anyone who's ideal companion is a foot soldier for the dark side.